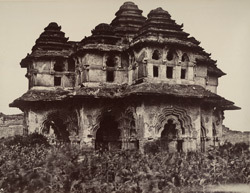 Photograph of the Lotus Mahal at Vijayanagara, taken by Andrew Charles Brisbane around 1856. Vijayanagara, the City of Victory, was the seat of a powerful Hindu kingdom in Southern India from 1336 to 1565. The kingdom was founded by two brothers, Harihara and Bukka, formerly chieftains with the Delhi Sultanate. Vijayanagara flourished as a prosperous centre of Hindu art, culture and architecture, until the Battle of Talikota in 1565 when it was defeated by the armies of a coalition of neighbouring Muslim kingdoms, its rivals for supremacy in the Deccan. The ruins of this vast royal city on the bank of the Tungabhadra River surrounded by granite hills, incorporate distinct zones, and are divided into two main groups, the sacred centre and the royal centre. The royal centre was the residential area of the royal household and included zones associated with the ceremonial, administrative and military functions of the rulers. The Lotus Mahal is a two storeyed pleasure pavilion situated in the zone of the royal performance. It is built in a mixed style with Hindu and Muslim architectural features. The two storeys have openings with lobed and recessed arches with decoration in plasterwork, supporting a series of vaults and domes. The stepped pyramidal roofs are capped with temple-like finials.